The common hawthorn or crataegus monogyna is a species of hawthorn native to Europe and Britain, where it is the most widespread species of the crataegus genus. As a result, the simple word “hawthorn” generally refers to this specific species, even though the less prevalent crataegus laevigate or Midland hawthorn is also native to Britain, where it mainly occurs in the Midlands. The hawthorn is a deciduous shrub or small tree with spiny, thorny branches and lobed dark green leaves. 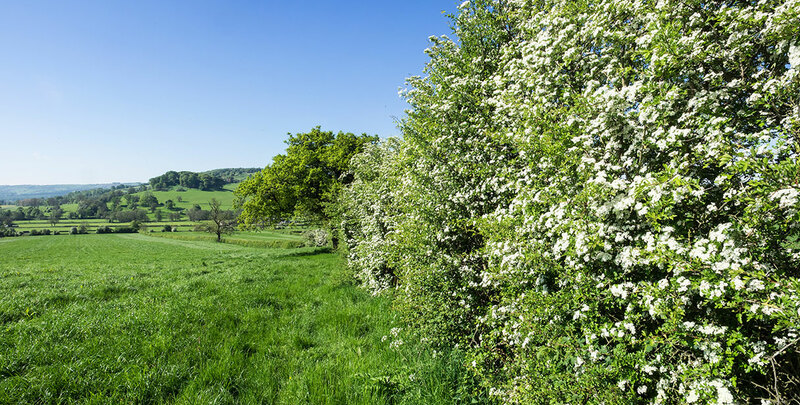 But what really sets hawthorn hedges apart are the sprays of scented creamy white flowers, followed by berries that are known as haws, which was also the Old English word for “hedges”. Other common names for the hawthorn include quickthorn or maythorn. 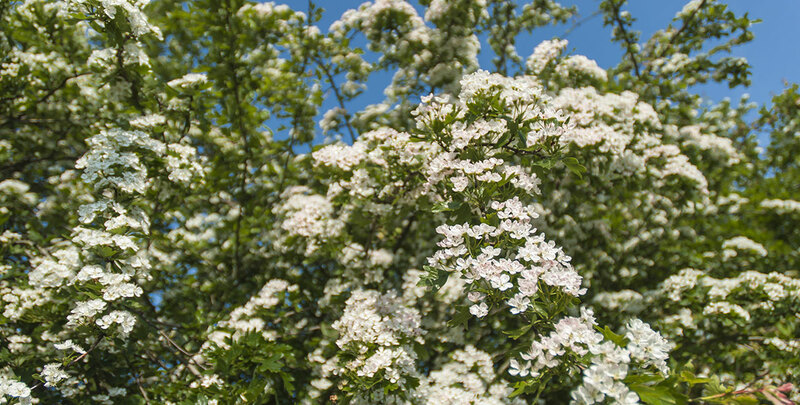 One of the most prevalent species in countryside hedges, the hawthorn is a very common sight all over Britain. It is the native British country hedge par excellence and is extensively planted all over the British countryside. Hawthorns make thick, dense, thorny boundary hedges that grow very quickly with an average growth of 45 centimetres per year, which explains the common name “quickthorn”. Due to their nature and growth habit, they are not suitable as formal hedges, although the vigorous shoots can be kept under control if they are neatly pruned twice a year. This pruning should be done in the summer or autumn, after the plant has flowered. This will grant your hawthorn hedge a somewhat more formal character. Since the hawthorn is native to Britain, it is inextricably linked with British folklore. In Celtic lore, it was said that the hawthorn could heal a broken heart, while in Gaelic folklore, the entrance to the otherworld is marked by this plant. 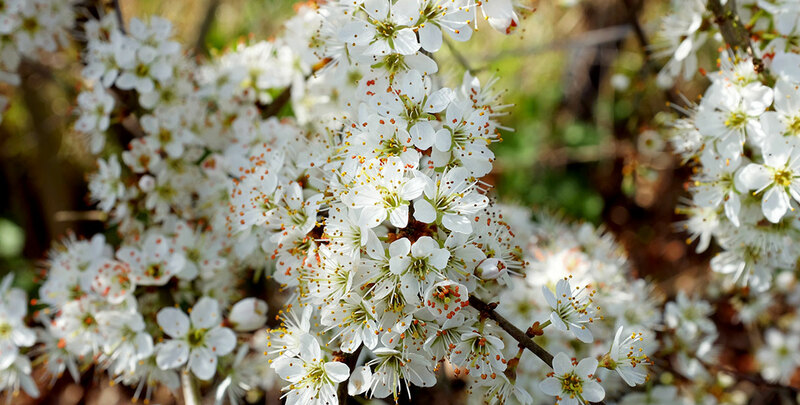 In the Victorian era, the hawthorn stood for hope in the language of flowers. But this plant was also appreciated on the other side of the world, where it is used in traditional Chinese medicine. While it is mainly used to aid digestion there, the hawthorn has been used in our part of the world to stimulate the blood flow. 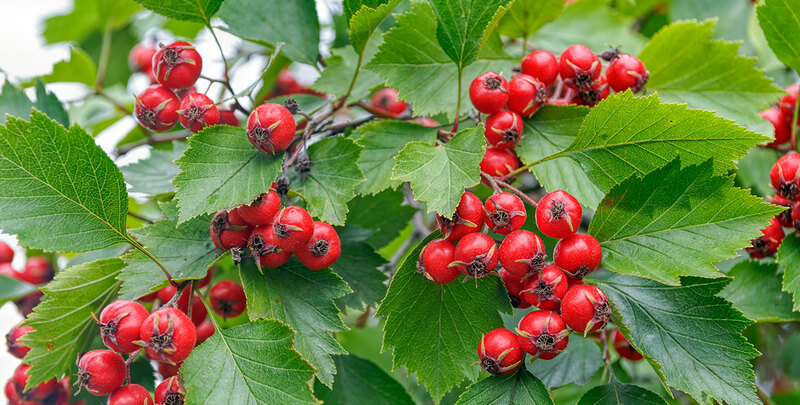 The haws themselves are edible and often used to make jellies or wine, while young hawthorn leaves can be used in salads. Yet humans are not the only ones who can enjoy the hawthorn. The glossy, red berries, which mature during the autumn and remain on the plant into the winter months, form a good food source for birds, while its branches create nesting sites for birds and provide shelter for insects and all kinds of mammals. All of this makes the hawthorn a plant with enormous wildlife value. It has even been suggested that it has been essential to ensure the continued existence of certain species nowadays. Its thorns keep large grazing animals at a distance, which does not only protect its own future, but also allowed other plants, such as the oak, to continue growing in areas where these animals wander around. Hawthorn hedges are known as extremely tough and it has proven worthy of this reputation throughout history. It will, for instance, grow happily in a garden located near the coast. Due to strong winds and continuous salt sprays, coastal sites are detrimental to most hedging plants, but hawthorn is not one of them. It will stay strong and healthy in any other windy location as well. So, if you have a garden at a location that is generally seen as difficult, your hawthorn hedge will very likely do just fine. It can even cope with wet soils much better than most other hedging plants. In fact, it prefers wet or moist soils, though it is capable of dealing with drought. While the painful sting of the spiny thorns makes trimming a hawthorn hedge a somewhat unpleasant prospect, these thorns do contribute to the impenetrable nature of the species. Most intruders will immediately be deterred by the idea of having to make their way through the fortress of thorns, which makes hawthorn the ideal hedge plant if you have anything valuable to protect on the inside of your hedge. This explains why hawthorn is often seen in the British countryside, as it is very unlikely that any hungry mammal will make it past a hawthorn hedge and eat the crops that are grown at the farmsteads. Birds also like to build their nests among the branches of a hawthorn, as it will protect their eggs from predators. It can also be used to ward off burglars. While hawthorn hedges are still highly popular, practical countryside hedges to this day, they are not without ornamental value. Therefore, they also make a fine garden hedge. The creamy white to pinkish white flowers are beautiful and the brilliant green and red leaves will certainly provide your garden with a rustic character, while the red berries will bring a little colour to your garden during the winter months. Furthermore, due to its attraction to wildlife, a lively environment around your house is guaranteed throughout the entire year. However, hawthorn hedges are still very suitable for their original purpose of protecting farmsteads, because it will certainly keep cattle or other invasive animals out and it will even protect other plants by means of its thorns. There is a reason why hawthorn hedges are the most common countryside hedges in Britain. The rustic look and thorny protection of a hawthorn hedge will certainly appeal to many garden owners. But hawthorn is also tough, undemanding and even very social, due to the role it plays in sheltering other species of plants and wildlife. It is simply a very pleasant hedge to have in your garden or on your property. Unless your property is in an actual bog, you will not have to worry if your hawthorn hedge will thrive. You might also consider a mixed hedge with other country hedging classics such as blackthorn and rosa rugosa. This combination would also make an excellent intruder hedge. The hawthorn hedge is a very versatile hedge that will feel at home in every garden and on every farm. And then there is the fact that hawthorn is native to Britain. A majority of the hedging plants that are popular in the UK have been imported from somewhere else at one time or another, but this strong species had already proven its ability to thrive in our climate long before it became the beloved hedging plant it is today. If you are looking for a plant that will give you what you want without having to worry about it, look no further than the sturdy hawthorn.